This article was written to discuss the different types of meal breaks employees’ in California are entitled to under the law, as well as the compensation a worker who’s been denied lunch breaks stands to gain when represented by a good attorney. Most employees who work more than 5 hours in a day know that they are entitled to a uninterrupted meal period of at least 30 minutes. But it CA’s meal break laws are far more complicated than that. That is why this page goes to extensive lengths to explain this area of law. Mr. Robertson made the below whiteboard video to detail CA’s meal break law without legal jargon. But it is critically important that you read the rest of this page after watching the video. The video is simply an introduction, this page flushes out the things employees and employers need to know to stay on the right side of the law. (a) An employer may not employ an employee for a work period of more than five hours per day without providing the employee with a meal period of not less than 30 minutes, except that if the total work period per day of the employee is no more than six hours, the meal period may be waived by mutual consent of both the employer and employee. An employer may not employ an employee for a work period of more than 10 hours per day without providing the employee with a second meal period of not less than 30 minutes, except that if the total hours worked is no more than 12 hours, the second meal period may be waived by mutual consent of the employer and the employee only if the first meal period was not waived. An employer may not discourage or impede meal periods. If the employer has the employee do any work during his or her lunch break, the employee must be paid for it. A companys’ obligation is to relieve its employee of all duty, with the employee thereafter allowed to use the meal period for whatever purpose he or she desires. 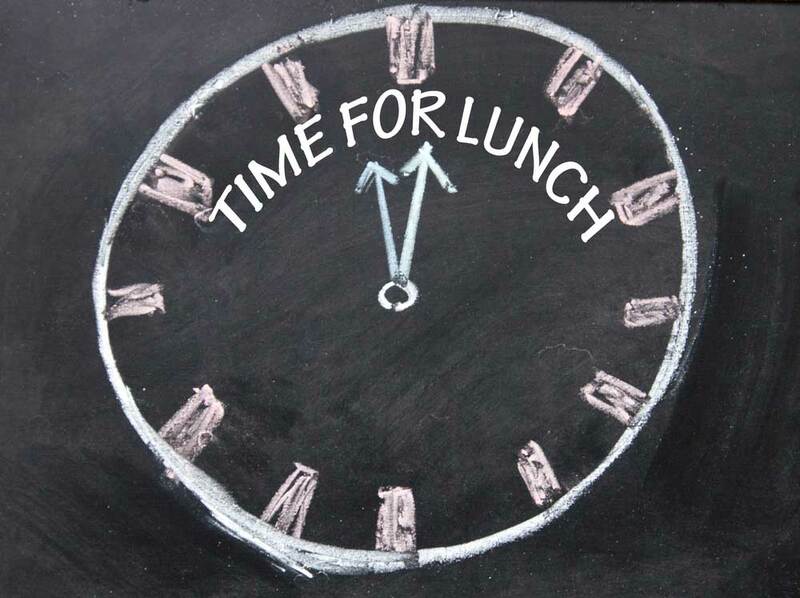 The 30 minute lunch break itself does not count as part of the hours worked (meaning its unpaid) if the employee is allowed to leave the premises and is relieved of all duty during that period. That means no phone calls, no helping customers, no checking emails, no running errands for the boss on the way to pick up lunch. It means the employee is free to spend that time how he or she wishes. While we cover damages extensively at the bottom of this page, it is worth noting now that an employer who fails to provide meal or rest periods as required by an applicable Wage Order must pay the employee one additional hour of pay at the employee’s regular rate of pay for each work day that the meal or rest period was not provided. If the employer relinquishes control and the employee decides to keep working with the employers knowledge, then the employer must still pay the employees hourly rate, but not an additional premium. Before you continue reading, sign up for our free monthly employment law newsletter! We will email you useful employment information that will help you protect yourself from workplace abuse. Can an Employee Waive Their Meal Breaks? Sometimes. First of all, the California Labor Code requires the employee and employer to mutually consent before a meal break can be waived. Second, as LC 512 clearly states above, in the case of an employee working more than 10 hours, the second meal period can only be waived if the first meal period wasn’t waived. Third, if the employee will work between 5-6 hours, the employee and employer can mutually waive the first and only meal period. While a worker can request that lunch periods be waived, it is unlawful for an employer to harass or intimidate a worker so as to discourage them from taking their legally protected lunch break. In 2017, TJ Maxx was ordered to pay $8.5 million to California workers in a meal break case. Back in 2014, there was a public-entity lunch break case that highlighted a worker’s right to spend his or her lunch break uninterrupted. The LA Times told the story of Los Angeles sanitation workers whose lunch breaks were being unlawfully regulated. In that case, the city had become so concerned about the appearance of trash truck drivers taking naps in their rigs during lunch breaks that it enacted a rule barring the practice. The city also enacted rules prohibiting workers from meeting more than one colleague during lunch due to concerns that a gathering of sanitation workers at a local diner might somehow be cause for concern. This policy was in place for nearly a decade before the drivers sued the city, arguing that the sanitation bureau was inappropriately limiting their off-duty breaks. The court agreed with the sanitation workers, and ordered the city to compensate the drivers with back pay. The city settled with the drivers to the tune of $26 million. Do You Need a Lawyer for Lunch Breaks Violations? If you make $30/hr and your boss won’t let you take a uninterrupted 30 minute meal break your boss is supposed to compensate you with one hour of premium pay ($30) on top of the hours you worked that day. Now most people wouldn’t sue their boss for $30. However, you might want to sue your boss if your boss consistently violates the rule. That $30 penalty applies per day per meal period. And if you add them all up, that could be a lot of money. If you’ve been denied a meal break every day for the past three years you could be owed $22,500. If you add that to a few other wage and hour violations, such as rest break violations, unpaid overtime, or record keeping violations, that number could hit $100,000 with ease. That might motivate you to contact our employment attorney. If you are dealing with an employer who is making you work on your lunch breaks, it is suggested you contact a good lawyer. A good lawyer will be able to look at your situation, and inform you of the opportunities you have to recover lost wages — opportunities you might miss when filing a complaint on your own. In addition, a good attorney will know the best way to either reach a settlement in your case, or put the pressure on to win your case in court. Our office is located in Orange County, but we serve clients throughout all of California. What Can an Employee Recover in a Lunch Break Violation Lawsuit? While it’s impossible to predict a specific dollar amount when a person wins a settlement or judgment against an employer, it’s possible to discuss the different types of compensation a worker might be entitled to. As mentioned earlier in this article, an employee might be able to collect back wages for the time spent working during lunch breaks. In cases where an employer has retaliated against a worker for reporting the violation, there are a number of different remedies. For instance, if the worker was wrongfully terminated for reporting a violation, he or she might be entitled to lost wages. A hypothetical example of this type of compensation might involve a person making $50,000 a year. If that person were unable to find work for three years after the wrongful termination occurred, that person could potentially recover $150,000 in lost back wages. Workers who suffer from physical and emotional ailments as a result of harassment, or retaliation due to violations of lunch and break rules, could potentially collect pain and suffering damages. These can be substantial, and are often the largest part of a case. Pain and suffering can occur in a number of different forms and includes: headaches, nausea, depression, anxiety, insomnia, and other ailments. In rare cases, an employee might be able to recover punitive damages. These types of damages were designed to punish the employer and prevent the violating behavior from ever occurring again. While these types of reward often result in high judgments, they are difficult to achieve because the worker must show that the employer acted with fraud, malice or oppression. There are a number of reasons why a person who believes they’ve been treated unfairly by an employer should contact an attorney. Not least among these reasons is the fact that employers are more likely to take a lawsuit seriously if the employee is properly represented by an attorney who has a solid track record of victories and settlements in employment cases (as this office does). Furthermore, in addition to having knowledge of the law, a good lawyer will also be a skilled negotiator. This could prove helpful in achieving settlement and avoiding the ordeal of a court trial. An employee typically has little to lose in contacting a lawyer as most employment attorneys provide free consultations. Additionally, attorneys frequently take cases on a contingency basis, which means the client doesn’t pay out-of-pocket expenses. If you have questions about California lunch break or rest break rules, or some other legal employment question. Contact our office to see what we can do to help you. * Mr. Robertson was not involved in any of these cases and they should not be seen as a guarantee or promise as to the result you may achieve in your case. Can I sleep during my 10 minute break? I am currently working in an environment where I am denied lunch break within first 5 hours work, constantly. The employer does not have scheduled breaks in my department, but does in others. The employee pays for breaks time, but constantly don’t get breaks. There are employees working side by side with me that get multiple 30 minute or more breaks within an 8-12 hour shift, where I am only given two ten minute breaks. When I bring up to supervisor I am told to eat at the machine while it is running, that if I complain higher up I may be fired or given mandatory 12 hours in attempts to make me quit. I am also told by supervisor I can’t complain because he doesn’t get breaks either. If you have not already, call our intake line for a consultation – (949) 667-3025. I am paid salary at 1400 a month. I am denied rest and meal breaks. Am i eligible for reimbursement? I was also fired based on my sexual orientation and the fact i wanted to report a crime that took place and my employer wouldnt allow me. From what I understand of your situation, you can possibly sue for meal break violations during the time you worked for the company in CA. Can I Sue My Employer if they cheat my break? That depends, Jose. Yes, you can sue, but the question is for how much and is it worth it. The only way to find out the answer to that question is to call an employment lawyer. I been at this company for almost 5 years I work the night shift 9:45pm-8am I’m only entitled to a 30min lunch before the other manager leaves (usually my lunch is within the first 2 hours of clocking in) once I’m by myself with two regular cashiers I’m not allowed to take lunch or break since I’m the only manager at times I been asked to stay past 8am since the next manager is late usually 15-20 minutes do I have a case?? I’ve been working for a company for about 1 year now, as a delivery driver. The company has a lot of work going on and we’re given 30 min breaks by default after 5 hours, but on the road we never have time to actually stop and grab a meal because there’s so much to do. When I first started I remembered both my manager and warehouse manager telling me “you are entitled to a 30 min lunch, but you don’t have to take it if you don’t want to and if you don’t just make sure you write it down either way and clock out for it”. I already know this is very wrong, but given the fact that I only heard this and didn’t get it in writing is there something I can do? I work in a Company as a Mobile Patrol car driver my work schedule are 8 hours and 12 hours a day and I get my week off after my night shifts and that too for 24 hours morning 6:00 I relive from my duty and next day morning 6:00 I have to join my duty as a mobile patroling vechile Driver I should always drive the vechile and my breaks dosen’t sure me Bcos we have breaks for 15 , 30 and 15 min which is not suitable for mobile patroling drivers and that too in Hyderabad which has heavy traffic 8 hour’s shedule.so what is the correct way of getting breaks and weekoffs for drivers plz..
Hello I was wondering I’ve never had a 30 min break while working. What could I do about it. Call a lawyer! We sometimes take meal break cases like this. Does your office only handle cases in Califonia? I am not offered a meal break nor my 10 min breaks. There is never anyone there to cover me for my breaks and when I asked my boss (who is the owner as well) for a 10 min break he said “I think I need to cut your hours because you keep needing breaks” I have been working for them for almost a month and haven’t gotten 1 break and I work 6 to 8 hours a day. What should I do call the labor bored and/or a lawer? Yes, only California. But your state may have similar laws, so call a lawyer in your state. I worked for a family as a laundress for three years, I got fired with no reason, We had to stay in the house for 9 hours, 1 hour for lunch break from our time, we got paid only 8 hours, but we never got breaks paid, can I sue them to get a compensation? I worked for 6 hours, my supervisor denied my lunch at the 5th hour. He asked if i wanted to skip my 30 minute lunch at the 5th hour to which i said no. He insisted he knew the law and that i was only entitled to two 10 minute breaks. In the end i only got two 10 minute breaks in a 6 hour workday. He made me punch out at the 5hour and 59 mark to ensure i wouldnt reach the 6 hour. Do i have a case? I’ve been working at the same company for 3+ years and most days my lunch break is after 5 hours. Also, for the 1st year or so, my boss would make our team clock in and out for a lunch at noon, even though we never left our desks. We would be allowed to leave our desks for a break after 6 to 7 hours of work. So my boss made us falsify our time sheets. How do I prove that my boss did that as well as bully us into not taking our regular breaks, threaten us with termination and make the work place very stressful? I’m having health issues due to the constant stress and lack of breaks. Do I have a case? Hi Jenny, your situation needs to be addressed by a lawyer. I would call us or an employment lawyer like us when you can. If I take my meal break after 5 hours. Say5.5 hours am I entitled to premium pay? I am a school bus driver and hold a field trip position in my facility. My company is telling me I have to sign off the clock for my 30 min lunch break even though I am in a parking lot several miles from my facility waiting for my group to return to the bus to go home. I have looked into federal law and state laws as well as code 512 of the labor board and they all are very vague. I write on my paperwork that I take a half hour on duty lunch and they say no. I cannot leave my bus and even if I could there is nowhere to go. Please give me advise. Hi, your employer may have a union which dictates whether or not you should get a paid lunch or not (while on duty). Does it? If not, then the regular CA wage & hour law would apply and they should pay you for any break where you are under the direction and control of the employer. Good morning I work as a contractor with an organization at a level 4 prison in California. We are greatly understaffed and are required to relieve our other coworkers for their 10-minute break. However we’re only receiving 10 minute breaks for an 8 hour shift. Are 10 minute breaks are also interrupted due to conversations with inmates having to do our time cards. Are 30 minute break is interrupted due to inmates needing to set up groups us needing to print are materials for a current groups. Please provide me with some information thank you are some assistance. Just left a VM for a consultation. Employed 1 year with a company. Worked 6-13 hours a day. Never offered rest periods or 2nd lunch. 1st lunch was offered but never given time to take it. Also made us work the first and last hour without pay. Also never received PTO when I resigned. Do I have a case? I have been employed by a restaurant for roughly six years. This restaurant is corporate. In the six years as a 30 + hours a week employee I have received one meal break. And that was because I was dangerously close to approaching overtime. I have received zero rest breaks and one meal break in 6 years. That is no exaggeration. Lately I have been getting ridiculed by management and other employees when i simply use the restroom once a shift. I don’t linger nor hang out in the bathroom either. I’m a bartender so I’m constantly in the public eye, so I do my business, make sure my makeup is still presentable, then run back behind the bar. I’m not going to not use the restroom in an eight hour shift so recently my shifts have been drastically altered. By that meaning from me going from working almost all of the most profitable shifts to me working mostly mornings which don’t really earn very much at all. I do traffic control. 90% of our jobs are 2 way flagging. 8-12 hrs or sometimes 12-16 hours a day with no breaks, lunches, or bathroom breaks. While the company we are contractors for, they get to take there breaks and lunchs. We still have to control traffic. We just cant leave the job. After we return to our office. They make us sign a piece of paper say. At 1 point we tried to take a break or lunch if we dont sigh it. We wont be schedule fpr furture jobs…. Do i have a cases. I am a county employee and we are under a union contract which addresses rest breaks with the simple statement: “The department MAY provide breaks.” We work straight through 8 to 11 hours a day and get paid straight through. Of all the job titles in our department, ours is the only one that does not allow for meal breaks or rest breaks. We are also among the lowest paid with the most unbelievable workload, such to the point that several of us have begun to suffer from stress and physical issues. There are not that many of us, but none of us has ever gotten breaks. Our employer hides behind a governmental exemption and contract phrasing. Might we have a case? I’m not sure. Union employees and government employees fall under different rules. I would contact a law firm for a in-depth look at your situation. It is not as easy to determine like it is for a private company. You might. I would contact a firm like ours for a consultation. I would recommend calling a lawyer. That sounds terrible. Union cases are difficult, but sometimes they are worth pursuing.